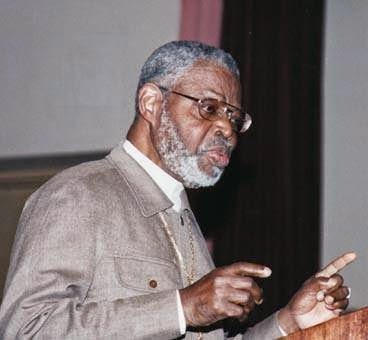 Caribbean Spirituality and Understanding in the Diaspora: SPIRITS of the RIVER! 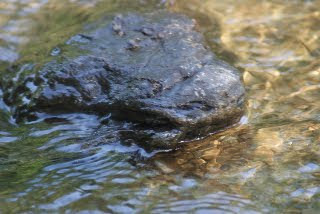 "Chola Wengue" is within the manifestation of the River, as well as many other energies. 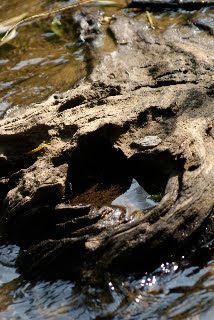 When we go to the River we go to ask Chola Wengue for her blessing, or perhaps to do an offering, or Ebo, or a trabajos of some kind, or sometimes to cool off from the heat of the summer. 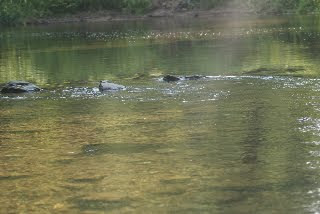 On this day the heat was intense but the water was very cool, immediately refreshing and uplifting. 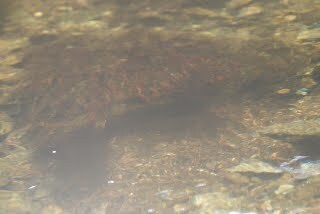 We enjoyed the River's coolness and energy and spent some time taking some photos. 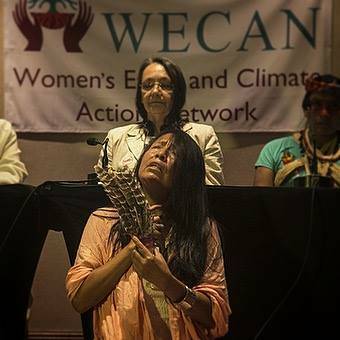 What is clear from the photos is that there are many Spirits within what we term "Chola Wengue" and to consider the "River" singular is to dismiss the many Spirits within the River. 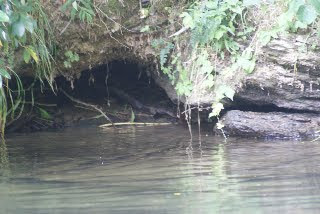 Here a small cave is formed by the flow of the River under a large stone on the bank of the River. You can see a Misterio right in the cave itself if you look closely. Note here the current is very gentle. 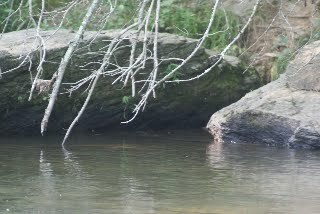 Here you see a boulder angling out of the River in front of the Manigua and a much larger Stone. 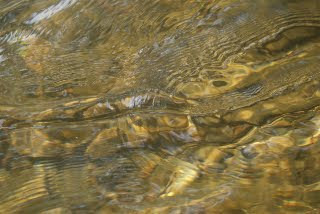 In the ripples of the water many energies are visible. 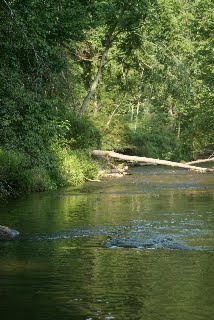 In the other photo a tree had fallen in the water and the flow of the water has shaped the tree. A Large Faced Spirit is looking right at us! 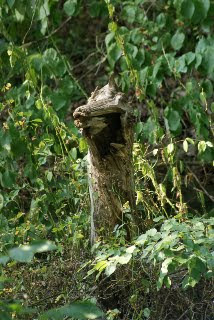 A tree stump on the River bank looks like an Ancient Creature. 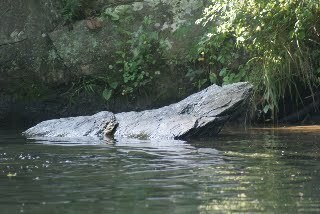 A large Stone in the River looks like some kind of River Creature coming up for air. Here you see the Golden Waters of Chola Wengue, and if you look carefully you can see many more Misterios within her! 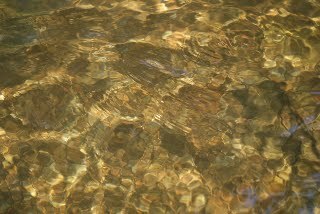 Here a stronger current is visible, yet the reflection of the golden bed of the River is still visible beneath the Current. Within the many ripples many faces look out. Under the water a large stone "dressed" with algae can be used for certain trabajos or to put in a bilongo (etc.) as appropriate. The varying currents and energies of the River. In some places the water is more quiet and becomes warmer, where the current is faster the water stays cooler, so as we move through the water different energies surround us. Definitely Mama Chola is not Singular in her many expressions and many companions. 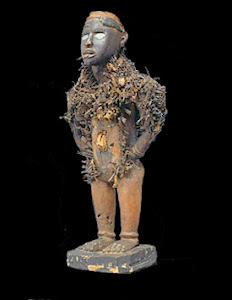 When we go to do Ebo with her it is very important to be sensitive and aware of the many Spirits (Good or Bad, Rough or Gentle, Sweet or Sour!) who we are encountering!